Hundreds of meters of weld seams run through petioles in Jukka Lehtinen’s piece of art. Large flowers extend as high as three and a half meters, and two vast strawberries of steel hang in the air, weighing over 100 kilograms each. 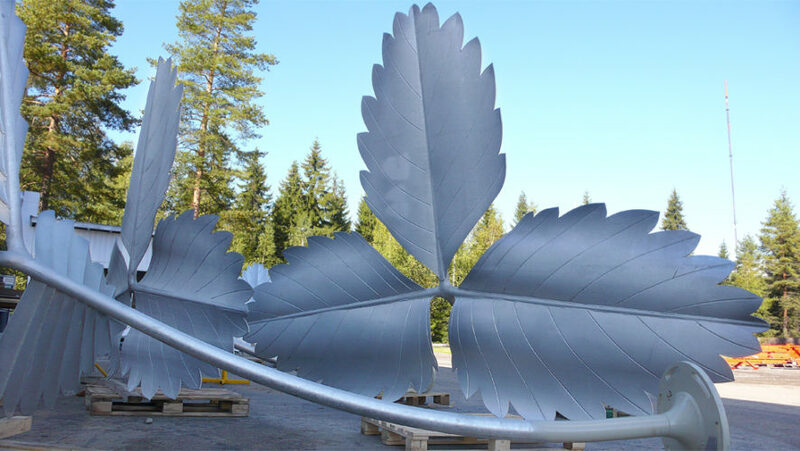 This piece of art, commissioned by the Finnish Parliament, was made with Kemppi equipment. In 2005, the Finnish Parliament announced an art competition with the goal of finding six pieces to decorate the extension of the Parliament building, the ‘Little Parliament’, built next to the Parliament house in Helsinki in 2004. In total, 1,700 pieces of art were entered in the competition. The most prominent and the heaviest of the winning pieces, Jukka Lehtinen’s Oma maa mansikka, was unveiled on 9 October 2007. It is the only one of the winning works to be publicly viewed in front of the Little Parliament. The arrangement of Lehtinen’s piece is delightful: wild strawberries have been planted in the pool, and Lehtinen’s sculpture also depicts wild strawberries, but in huge size. A ten-ton construction exuding Finnish knowledge of metalwork and welding technique emerges from the midst of small and fragile natural strawberries. There is no need to explain the name of Lehtinen’s piece to Finns, since ‘oma maa mansikka, muu maa mustikka’ (‘my land’s a strawberry, other land’s a blueberry’) is a common Finnish expression generally thought of as a metaphor referring to how it feels to be in one’s homeland as opposed to abroad. Lehtinen gives further significance to the name Oma maa mansikka by explaining its background. Thus, to emphasize the significance of the Parliament for the independence of Finland, wild strawberries were chosen for the pool beside the Parliament building. Despite its massive form, Lehtinen’s piece gives a delicate impression. It seems as if the metal flowers that reach upward and the metal leaves that are open to receive sunlight have grown naturally to take their positions. The delicacy of the strawberry leaves is, however, a result of careful design. They have been made with edge planers, following strict calculations. 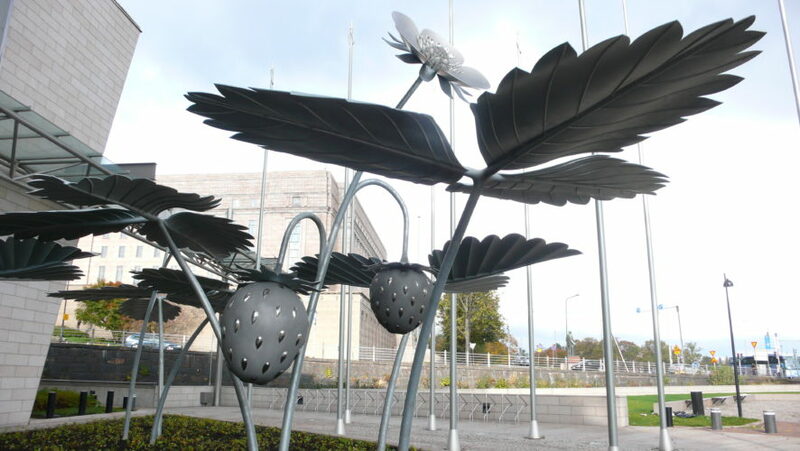 The petioles have been welded from both sides, and the flowers are supported by 85-millimeter-thick Imacro steel beams. The sculpture was prepared by Holmet Oy, a company from the town of Hollola, Finland that provides steel structures for use in such applications as earth-movers and luxury cruisers. While the company has broad experience in the metal industry, making a strawberry sculpture was a completely new experience for them. Reima Niemeläinen, plant manager for Holmet, says that the project was very demanding. It was necessary to develop new work methods for certain phases of the project, and many situations that the company faced in the process were solved with case-specific solutions. According to Niemeläinen, the amount of weld seam required for the piece was so high that there are good grounds to call it a piece of welding art. The sculpture has been welded completely with Kemppi’s equipment, and the project included other close cooperation as well with the two companies. 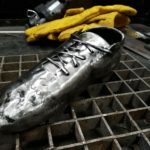 “This is such a unique work of metal that, to solve certain welding issues, it was necessary for us to call a welding expert from Kemppi to give us practical instructions,” says Niemeläinen. Niemeläinen has been familiar with Kemppi’s machines for decades, since he has that many years of personal welding experience. “The best features of Kemppi’s machines are their reliability, excellent service, and – of course – Kemppi’s location near us,” he says. Due to the nature of the construction, its ability to bear loads was calculated very carefully and tested with great precision. Snow or other kinds of loads will not harm the sculpture in any way, nor will wind. The solidity of the seams is crucial for the robustness of the piece. Therefore, great care has been taken to find the best attachment method and welding process for each seam. 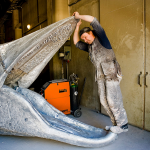 The total length of the weld seams in the sculpture is more than a kilometer. 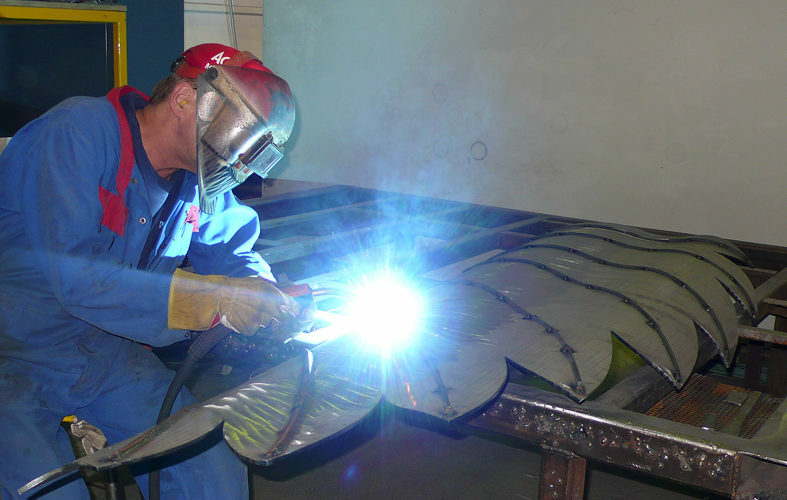 Most of the welds have been performed with MIG machines, but TIG welding has been utilized as well. The massive strawberries were made by welding two molded pieces together. One of the strawberries weighs 100 kilograms and the other 150 kilograms. 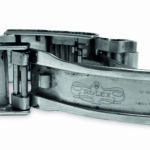 Niemeläinen says that it would not have been sensible to make a piece of this size and of this form with a single mold. The enormous strawberry field beside the Parliament building, at one of the most famous locations in Finland, is an impressive work of art. At the same time, it is a fine specimen of skill of Finns in metalwork and welding. Artist Jukka Lehtinen (left) consulted Plant Manager Reima Niemeläinen at Holmet many times during the machining of the strawberry sculpture. The petioles of the strawberry were attached with tack welds and then welded from both sides. 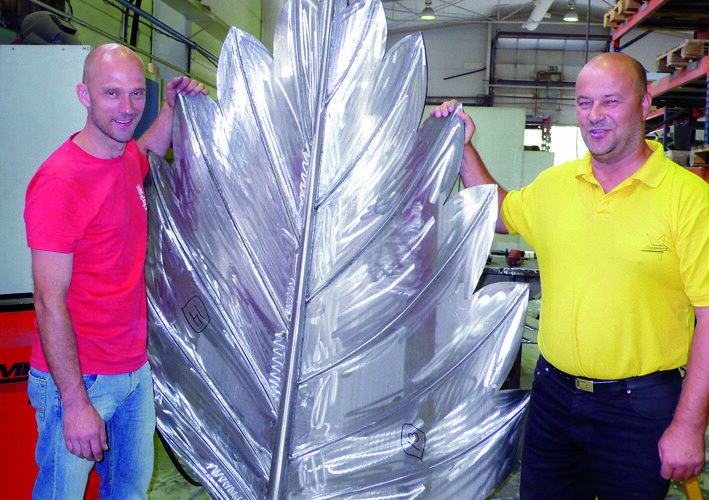 Each leaf has almost 100 meters of weld seam. The Kemppi machines used in making the sculpture were Kempomat 3200, Fastmig KM 400 + MF 33 wire feed unit, and MasterTig 2200. The enormous strawberry field beside the Parliament building, at one of the most famous locations in Finland, is an impressive work of art.